If you're in Wroclaw for more than a couple of days you should make time to strike out to the East of the city where a weird and wonderful world of unlikely tourist attractions await. 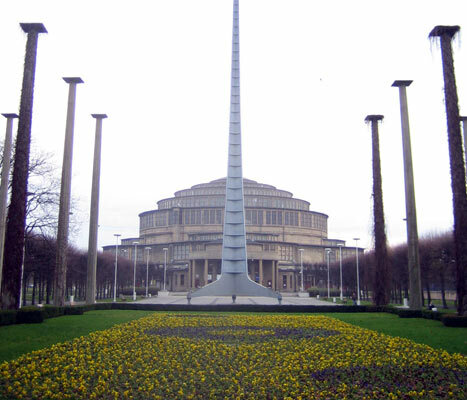 But leaving Wroclaw's Olympic Stadium, sprawling zoo and Japanese Gardens aside for now, king of the oddball attractions is surely the huge concrete palace known locally as the Hala Ludowa (People's Hall) or Hala Stulecia (Centennial Hall). It all began once upon a time, when Wroclaw was still the German city of Breslau, and the powers that be decided that it would be a nice idea to commemorate the hundredth birthday of bashing Napolean in the Battle of Leipzig by building an exhibition hall. It was Max Berg who was commissioned to design 'The Centennial Hall' (as it was then known), and so it was that one of Wroclaw's most famous architectural wonders came into existence in the form of this monstrous monument of modernism. We mean 'monstrous' in the sense that it is very big... it occupies 295,000 cubic metres to be precise and stands a towering 42 metres high, including a 23 metre dome. Insinuations that the Hala Ludowa is not the world's most attractive building are easy to make, and certainly only a Wroclawian would argue that the venue is a looker, but one thing anyone who knows their stuff will tell you is that Max Berg's baby was a pioneering work of engineering and design. Indeed it is the Centennial Hall's importance as such that earned it coveted UNESCO approval, making it a world heritage listed building. Unlike most UNESCO listed buildings however, the Hala Ludowa isn't drawing its pension just yet. In fact the People's Hall is one of the most active recreational spaces in Wroclaw, hosting special events ranging from trade exhibitions to big name concerts. Once a year the Wroclaw Opera Company perform here, there's the One Sound Love Reggae Festival, Paul Oakenfold is spinning in 2007, and of course there's a massive New Year's Eve party held every December. The official website is currently only available in Polish, but you can find a programme of their events here. Otherwise check our Wroclaw events calendar, where we publish some of the highlights. On the same grounds as the Hala Ludowa are several other noteworthy buildings and monument for the inquiring tourist to nose around. The Four Dome Pavilion is a fascinating building designed by Hans Poelzig for the Centennial Exhibition, and now used by the Wytwornia Filmow Fabularnych, whilst the large semi-circular colonnade, also designed by Poelzig, makes for a pleasant stroll just to the East of the hall. The pond that it encircles becomes a popular ice-rink in winter! Finally, you'll unlikely to miss the 96 metre high steel spire erected in front of the Hala Ludowa in 1948 to commemorate the 'Restored Lands Exhibition', an event designed to make the Poles feel good about the German territory they had acquired after the war. But that's a complicated political landmine best sidestepped! For contact details, reader reviews and a location map click on our Hala Ludowa listing.